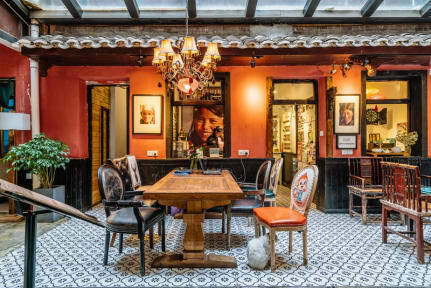 Chengdu Mix Hostel Poshpacker i Chengdu, Kina : Boka nu! Recommended by 'Lonely Planet Tibet' (7th Edition) as one of the reliable agencies for Tibet permits. 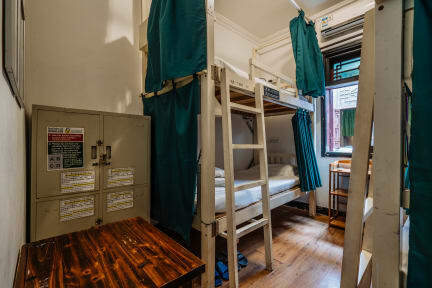 The legendary Mix Hostel is a small and more than 30 years old Sichuanese style house hidden in the bustling city centre with few minutes walk from city's largest heritage 'Wenshu Temple', it has been offering budget accommodation and tours exclusively for international travellers since 2004. Hostel is very much strategically located: 1 metro stop from 'North Railway Station' and 2 metro stops from 'Mao Statue', with short distance access to 'Wenshu Temple', it's not only super easy to get around the city but also a great chance to get touch with Chengdu's local culture. Sleep tight and got up, more comprehensive food menu is also ready from 7am till 10pm serving toasts, pizza, burgers, pastas while many local dishes can be also found on menu for those who would like to try a bit food adventure. After the solid rest and the treat to your stomach, hostel travel advisors are working with you to plan your trip, for lazy travelers you can just simply pick one of our 'good value for money' tours such as 'panda tour', 'Sichuan opera', 'Yangtze River cruise tour' and more to get a hassle-free journey (find more comprehensive tour brochures at front-desk please). * It's subject to change the date due to the weather condition or the conflict with other events. This was a great place to stay in Chengdu! I can really recommend it. What I especially bring with me is how helpful the staff was. Whenever we had a question they had an answer and they even helped us rebook our flight ticket over the phone, which took more than an hour. Amazing, thank you very much! I had booked for only three nights, at least three weeks in advance and still they wanted me to move bed and room (to another 4 female dorm) between the first and the second night. The bunks didn't have individual bedside lamps and the whole bunk bed moved whenever someone rolled over. That said, the place has a nice vibe and a good location close to the Wenshu temple and a short walk to the metro.